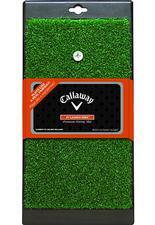 Practice your drives anywhere with the portable Callaway® FT Launch Zone™ premium hitting mat. Suitable for indoor or outdoor use, it features a true-turf surface that plays like a real fairway, as well as an ultra-durable rubber backing that protects clubs from damage. Dimensions: L 16" x W 8" x H 1"
If you have any more questions about the Callaway Golf FT Launch Premium Hitting Mat ; do not see the model you are looking for; need custom options; or prefer to not purchase online, then please call us at (630) 656-1291.